Note: blurp is out of date. Just returned after a long break. Will update this later. Hello, I'm Weapon. (I agree it's an odd name but I'm accustomed to it.) Most of my time on Neo I spend maintaining my sites. If you're interested in that sort of thing then you can read more about them under Sites. In 'real life' I'm an author, of fantasy, something I talk a little more about under Writing. Neopia and writing are both important (and long-lived) parts of my life and I am fortunate that I have both. This page contains a few different things. The navigation explains what those are better than I could. Coding, plots, Key Quest, my Neopets, blogging, my gallery, Team HW. Photography, reading, Neopets, coding, art, Geocaching, squash, words, exploring. 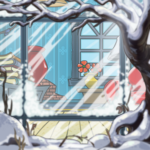 I love site-making and I love that Neopets provides the facility for it. I learned HTML and CSS from scratch because I wanted to make something of that big empty space that was my pets' petpages. I believe I also picked up some ideas about design over the years, though that is less definable. It is amazing what can be done with a blank space. Listed below are merely my own sites - please visit the Favourites area to see some truly awe-inspiring creations. Find A Laugh is a directory of screenies and humour. It was the very first site I created, dating from May 2006, and has past through many stages of evolution while I improved my site-making sk!lls. I've never been tempted to run a regular directory (by which I mean one that lists everything). The fact that FAL is specialised is one of my favourite things about it, as it means I have the time to include descriptions of each listing, extra sections like guides to screenie-making and also games (the subsites) like The Triv' Quiz and Question. The Triv' Quiz is a trivia quiz, as you may have guessed by the title. But it is not expected that anyone will know all the answers; you are encouraged to seek out the information you need, so you could also say it is similar to a scavenger hunt. It's a subsite of Find A Laugh and it opened in April 2011. The Quiz is always growing (160+ questions) and in that way provides (I hope) a never ending source of challenging entertainment. A Gift For Life provides untaken petnames. It began in October 2008 and has become easily my busiest site, working its way through around 5,000 names every year. It is by extension the site that requires the most time and effort from me, but I don't consider that a bad thing! I love inventing/finding new names and I love that it's a help to people. Filter Solutions is a coding help site focusing on what to do when the filters block your position: absolute or complain about your file extensions, or how to find your Save Changes button. It started in September 2009 when TNT made a major adjustment to the filters that capsized many people's layouts. Workarounds were being provided on the Neoboards but it helped to have them all on one petpage so that's what I did. Filter Solutions continues to be a collective effort whenever new filter changes are introduced. The Expanded Calendar (born May 2011) is a guide to annual and monthly Neopian events. It details the history of events so that you know what to expect from them today, what level of user-participation there will be, et cetera. It's 'Expanded' because it's a more informative version of The Neopian Calendar. I often found myself wanting to know more than the official calendar was telling, so compiling the guide seemed like it might be a good idea. When the writing is going well then I tend to do only the bare minimum here on Neo (dailies and regular site updates); when it isn't then I procrastinate by finding extra tasks, like improving my sites or adding to my gallery or studying the use of 'Rock Paper Scissors' in Key Quest. Some of these are rather old and not my best work. Proceed with caution. A clear and friendly explanation of copyright. Site-making. Advice on making a site successful, helpful, and accessible. Advice on both writing and laying out your text within the context of a webpage. Writing. How to use a thesaurus with moderation. Straight Forward Tips to Designing Better Petpages! Site-making. Advice on designing a page, from resolution to image file extensions to text readability. A hub for site-making news. A Neopian blog by Rainbow_daydreamer. A compilation of the average height and weight of each Neopet species. How to hide Neopets' ads on any browser. A summary of recent events, for when you've been away from Neopia. A fully functioning 'Like' button. Some very well-made petpage layout templates. Sooo I got frozen. o.o For 'suspicious activity'. Possibly the suspicious activity was me coming back to my account after three years and beginning to clear out and sell my old gallery and things like that. Anyway, that was the 21st. I sent in the form requesting unfreeze and waited. Yesterday I got a mail giving me a new pw (and nothing else, no explanation or apology). The first neomail I clicked on when I got back in was from the Charity Corner event. xD I got a silver trophy and two wearables for donating some items (I got up to about 1,000 points by donating a bunch of Healing Potions I had in my SDB). So it's all good I guess. I was surprised to find my petpages still intact - I thought they were cleared when one got frozen and that I would have to dig out my old backup files to restore them. My shop prices have been cleared, I will have to price those items again, and I had a trade up that was also taken down. Apparently Photobucket decided it isn't an image hosting website anymore so I need to re-host all my images for my sites somewhere else. tbh I don't think I'll be returning to running my sites, but I do want to fix the images so they look nice again for what it's worth. I've made a start here on the blog/stuff page. I did a little bit of catch up on the current plot, The Wraith Resurgence. I'm not sure what's going on, I've obviously missed some parts of the story because I'm joining part way through. It doesn't seem terribly interesting from this perspective. I'm following JellyNeo's walkthrough and I'm getting bored of grinding Wraiths in the Battledome. Didn't we do away with these Wraiths years ago? I'm amazed how many names I recognise on the boards. It feels like everyone is still here where I left them. Mumlynch still helping out with the daily puzzle answer, Foblin with his untaken petnames topic... The OLDPD... gah, nostalgia! Seeing my Neopets again was also very nostalgic, I guess I was very fond of them and their designs. I've decided to take a break from Neopets. This may sound strange considering I haven't blogged since December, but I have been updating my sites in that time. Now I won't be updating my sites. I might clear out used names from AGFL every week or two, because it hurts me to think of it becoming completely unuseable, but that's all. I will otherwise be officially absent. 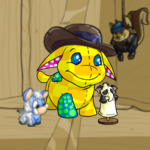 I've been moving away from Neopets for a while, I think. Partly because of how laggy and bug-ridden Neo has been in the last year and partly because I've become more invested in other things (namely, an MMORPG). It's hard to say which of the two is the worst culprit. I thought I would always continue to update my sites even if that's all I came on Neo for, but I just don't want to deal with this lag anymore. I've tried to wait for them to fix it and get back to making awesome plots and all that, but it hasn't happened yet. Saying I'm sick of it sounds too strong; I'm not annoyed or upset about it, I just... don't. So if I check in a few months from now and the lag has gone permanently then maybe I'll find the enthusiasm I used to have for Neo and will want to revive my sites and everything will be lovely again, but until then... bye. Hmmmm. I'm a bit worried about these two. Well, maybe not the first one. I don't think 790 is a particularly difficult score (I'm sure it's been higher previously) and I'm okay at the game so long as I have a guide at hand. SMELT, however, I have never understood. Done Challenge #1 without any trouble. Oh, someone on the boards pointed out that you can click on the 'Smelt' button in-game to get a fresh sheet of metal. I didn't know this. Suddenly the game is much easier. This game is ridiculously punishing. It's also punishing the spacebar on my keyboard. Yaaaay got it. x.x Moving on with gratitude. For a while there I had supposed the mystery game ('Flee Outbreak' ...?) was Itchy Invasion but apparently it's not. I even played Itchy for a few minutes (flailing madly because I'm bad at it) before checking the boards and discovering the mystery game is actually one of my favourites! Hmm not immediately sure what the mystery game is today. I'll start on the second challenge while I think about it. Still repeatedly failing Level 4. So what is this first game? The text under it says 'This Device is Programmed to Respond, Arf!' but that's not ringing any bells for me. Eh I'm going to cheat and look it up on a guide. Oh okay. I like this game but I still don't get how the text relates...? Ehhhh this game. Don't like this game. Done! Glad I don't have to repeat that for bonuses. One of today's prizes is a book, which I was going to say Rebme would be happy about, except he won't read it. xD He says it's boring. Ah, today we have games I dislike. Maybe this will take me more than ten minutes? I'm so bad at [Bouncy Supreme]. Fortunately 400 is not really a challenging score, so it only took me a few tries. I remember using a guide for Snot Splatter last time, so I checked the boards for some tips before starting. I got the score without trouble after that. The hint for today's mystery game is 'Round up those berries and roll' so I'm pretty sure I know what it is. Again it feels strange to be done so quickly. So this year's GMC has no teams and the challenges are recycled from previous years. I don't think I'm bothered about the lack of teams, but I feel like the reused challenges might impact my motivation for trying hard; if I've already succeeded or failed at these challenges in previous GMCs then why would I want to do them again now? But that's not going to stop me from giving it a go. I've already accidentally seen what [Goparokko] is in the comments on JN. I'm going to start with that one because I don't like the game much and I want to get it done. My highscore on it is 8,100 so I'm guessing I'll be able to manage 1,200. Hmm I can't remember which difficulty level is best on this. I *think* I used to play on Hard? I'll try that. Aaand that was quick too. This is Day One after all. It feels so weird only playing these games once. There are no bonuses or anything for playing them again. So... see you tomorrow! So. This is going to be about Neopets' downtime and the ensuing apocalypse, but I want to preface it with: Yes, I know I haven't blogged since July. Unfortunately I had other things going on and I didn't feel I had anything Neo-related to blog about. I'm honestly sorry about that. So Neopets went offline for scheduled downtime on the 17th September and was back up again on the 19th I believe. This was another step in the move to JumpStart. The downtime was to allow them to 'transfer all code, databases, and server infrastructure'. Maybe it was naive of me, but I imagined we wouldn't see any difference when the site came back up. Why would anything be different - or not working? They're just moving stuff from one place to another, right? Copy-paste, right? Nope. There has been a ton of bugs in the month since it came back up. I'm not going to get into listing them all, but seriously, in the first few days practically everything was having issues. There wasn't much you could do on the site without running into something that was bugging out. The worst bug for me personally was that petpages could not be updated. If you tried to save changes you got an error that was something like 'You have not specified a pet name!'. I totally understand that there were more important things to be fixed - things more central to the site's functioning, like shops and neomail - but I still felt sad when I came on every day to try to save changes and it was still not working. It was interesting how quickly I stopped bothering to do my dailies or read the Neoboards. It only took about a week. Then I only came on for the time it took to preview page, press save changes and sigh. I discovered it was fixed on the 13th October, but it might have been fixed the day before because I don't think I checked on the 12th. Awesome! Fantastic! So happy! New problem: You know the super-strict profanity filters that we've always had to wrangle with on the neomailing system? For some reason those filters are now being applied to everything: Neomail, Neoboards, petpages, userlookups, etc. The infuriating thing about the filter is that it blocks a ton of words that turn up inside other words. For exmaple you can't write sk!ll properly because of the last four letters. Of course, most of the blocked words are more inappropriate than 'k!ll' so I won't be repeating them here, but still. Why this change? I'm hoping (without much conviction) that this is a temporary measure and that we won't be forever blocked from talking about our Neopets' fishing sk!ll level. So I've been working on getting the rest of my sites updated again. TEC is done. Haven't done FAL yet. I tried to update Question but it can't load the preview; after I removed the profanities and tried to preview again it opened a white page, tried to load for maybe a minute and then gave up. Same thing happened when I first tried to update the blog here. I've had to (temporarily, I hope) remove a big chunk of blog entries (I went for everything pre-2013) before it would successfully load the preview and I could get it to save changes. The whole site is pretty laggy at the moment, so I'm hoping it's just that. Hopefully TNT will manage to speed the site up again at some point and it should be able to cope with super large petpages. The Kiko release started at about 01:15 am on the 17th. They remained available through the 18th. AGFL saw 23 names used on the 17th and 8 on the 18th (most of the second were not Kikos). The Koi release started at about 12:46 am on the 25th. They remained availible through the 26th. AGFL saw 10 names used on the 25th and 17 on the 26th. Previous years have all been just as low-impact. He's next on my list for a new petlookup, something I will hopefully not procrastinate on too much. I've had an unintentional break from working on the petlookups, you see, so I need to make an effort to get back into it. How hard is it, really, to reply to a neomail containing a Trading Post offer? I mean seriously. I have by now neomailed several different people who are selling the items I'm looking for and only one of them could be bothered to reply (and that reply was an almost-yes, except I missed my chance by going AFK). I'm assuming the reason the others haven't replied is connected to them not liking my offer, but in that case a 'No' would be excellent. I'm not even asking for a politely worded response (because apparently that's difficult for some people). Just a 'No' would do fine. A short and quick answer would be infinitely preferable to my waiting two or three days in the hope that they just haven't had the time to log on yet and are not in fact ignoring me. There was a small wait for the first release on the 4th: it started at about 02:43 am NST. I wasn't very attentive to the numbers this time but I think it followed the usual pattern of releasing throughout the 4th, remaining available for the 5th and cutting off before midnight. I'm feeling better today though, so it's all up to date now. Over the 4th and 5th AGFL saw only 128 names taken. Previous years saw 221, 239, 194 and 219. The release started at about 01:09 am NST on the 27th. The Cybunnies were released in batches throughout the day, though as per usual there were enough that they did not become unavailable in between batches. They also remained available for the 28th, cutting off some time before midnight. I bumped the untaken names topic on the Help Chat for the first half of both the 27th and 28th. (By 'first half' I mean the AM hours, which coincide with my daytime.) I don't usually keep the topic going for the second day; I did it this year because I wasn't busy doing anything that prevented me from checking in every hour or so. AGFL had 174 names used on the 27th and 19 used on the 28th, making a total of 193. Previous years had 172, 293, 216 and 299. Also, AGFL's total takens did not hit 25,000. Disappointment. I was predicting it would based on previous years, but no. In fact we only reached 24k as recently as 15th April. As of the time of writing we're up to 24,542. Will Hissi Day take 458? Unlikely. Speaking of which, Hissi Day is only four days away! D: I want to get AGFL's Fantasy section back up to at least 650 by then. Must try not to procrastinate on that. This morning I got the 'You happen upon a travelling library...' RE twice within a few page clicks. Rebme likes that RE. It's the Quiz's third birthday today so I've added ten new questions, taking the total up to 200. Also been inventing a character and customisation for Mere. I decided quite quickly that he (and he will remain a he after all) would probably be a Plushie Blumaroo (so cute and huggable) but then I spent a frustratingly long time going through backgrounds and things on JN's Wardrobe. I just want it to be perfect too much, you know? But I think I've found something that's nearly perfect. Maybe. Oh and I managed to complete Rebme's new customisation, that which I mentioned last month. I've been stalking the Trading Post waiting to catch the Cover of Darkness and the Well Read Book at reasonable prices. Rebme, as I've mentioned, likes books. So I figured he might get into searching for long lost libraries and things like that, hence this depiction. The release started at about 12:36 am NST on the 19th. (Always appreciating a prompt start after those long waits we've had in the past.) It proceeded as per the usual script: continued releasing in batches throughout the 19th; remained available in Create a Neopet for the 20th; cut off near to midnight. I did the untaken names topic on the Help Chat for the first half of the 19th. AGFL saw 218 names used on the 19th and 30 on the 20th. That's a little lower than last year (proportional to the lower created number, I assume). Success! Today I traded SoulScribe the UC Mutant Buzz for Mere the Starry Bruce. =D I love mere, the word, and it's lovely and short too so I'm super happy. He won't be staying a Starry Bruce (probably won't be staying a he either - Mere sounds distinctly female to me) but I currently have no idea what he will be. That's an exciting prospect though, the need to invent. 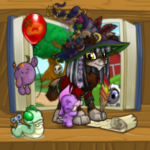 I've been doing some work on my other Neopian characters. I'm attempting to finish all their petlookups, an endeavour I abandoned probably a year ago (if I cared to look I could probably find a blog post about it, with a date). I'd run out of creativity at the time, but I'm up for it now. Oh and also I'm giving them petpets, those who didn't already have one. So far I've completed Life and Lost, neither of whose characters had yet been developed beyond their customisation so they were fun to do and satisfying to have done. I'm now working on Ddianc and Kimey, as a pair. I think their descriptions are going to lead from one to the other in some way, since their stories are intertwined. 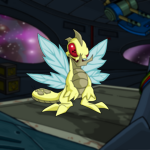 I found a well-named unconverted Mutant Buzz in the Pound. Yeah. I was pretty astonished too. I found him while I was making names for AGFL; I tried the name 'SoulScribe' and saw from the info on his petpage that he was a Mutant Buzz and he was in the Pound, so then I went to the Pound and searched his name there, and I saw that his image looked different to a converted Buzz, but I didn't believe it right away. Some Mutants are different anyway, aren't they? I had to go and look up what a converted Mutant Buzz was supposed to look like before I could be certain that he was UC. And then I adopted him. Presumably he was one of those 'stuck' pets (they don't show up if you browse the Pound normally) since no one else found and adopted him in the time I was debating. So, neat, I have a UC. I'm enjoying the novelty, but I'm really not fond of the pet itself so I won't be keeping him. I've been stalking the Pound Chat in search of Real Word names I like in the hope of trading for one. Mutant Buzz are right at the bottom of the UC popularity pyramid, so I wouldn't have much scope in trading for another UC with him and besides there aren't many I love. The Plushie Hissi is probably my favourite UC, but it's waaay higher in demand. Would you believe I've come down with another cold today, a week after the last one? Yeah. I really have. On the bright side this one isn't as thoroughly incapacitating; I've had a chill day and now feel awake enough to do a late update on AGFL. In other news, I finished NeoQuest II the other day! =D It's a very satisfying feeling. I definitely enjoyed it, despite the tedium. Plus I got a bunch of the new Random Events while I was clicking through Faerieland. Haven't had so many outside of NQ, but then there isn't much else I do that requires a lot of page loading. Yay, the random Random Events are back! And they've had a makeover, which is neat. I haven't had any yet but I imagine I might next time I play some NeoQuest II (I played some more yesterday - am now in Faerieland, the last stage). I've been reading some of the discussion about the new Coincidence daily. There is a lot of contention over it giving out avatars. Apparently it started by giving avatars much more frequently than it was meant to and it has now been fixed to being very very rare, but I don't know that this has any impact on the issue some people have with it. One of the arguments I read felt that avatars had or would lose meaning because we can no longer know at a glance how the user obtained it; did they get that very challenging game avatar through sk!ll or did they get it through chance aboard The Coincidence? I think I agree with this, although as I'm not particularly passionate about avatars and avatar collecting I probably don't mind it quite as much as the person who was making the argument does. Were I inclined to participate in the Coincidence daily at all (I'm still stuck on that very expensive quest) I wouldn't personally like to receive any avatars. There are difficult and retired avatars out there which I wish I could earn or wish I had been present at the time to receive (I love this Curse of Maraqua one) but I wouldn't want to obtain them this way. I probably wouldn't use them if I did. It wouldn't feel right to me. Some people feel that now that the chance of getting an avatar from the Coincidence is very very rare that it's more meaningful than if it were more common. Like, it may be only luck (and how can you brag about luck?) but I think even some entirely luck-based avatars like the Turmaculous one or the Lever of Doom one have a certain prestige of their own. If you obtained those avatars you probably had to persevere for a long time. But I still don't think the prestige of luck measures up to the prestige of sk!ll or of having been there during an old plot. In fact, I get the impression TNT too based their decision on the 'it's very very rare' thing. They knew a lot of people wouldn't like it, that it would be felt to be undermining the value of some avatars (anyone could have predicted that) but they went ahead with the idea with the provision of rarity as if the rarity makes it okay. Yeah, no. I don't think so. I think if you know the only way people might consider something acceptable is if you make it very very rare then you probably shouldn't do it at all. It's an imperfect idea; let it go. So the event appears to have ended and The Coicidence has become... a new daily!! 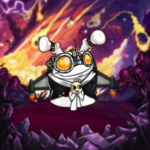 -.- Currently I'm still being asked for the same expensive set of items I've been ignoring all along (and no way to reject the quest) but on the plus side I've been awarded the Mechanized Laboratory Assistant petpet and the 'Aboard the Coincidence' avatar for my limited participation. I'm dubious (along with everyone else) about this new daily. It even seems to be giving out rare avatars, which doesn't seem right, although possibly (possibly?) they aren't permanent. Also are Random Events only on demand now or will we still be getting them while roaming the site? Remains to be seen. Also, I finally picked up NeoQuest II again. I played it all day on the 1st while I was bumping my TEC topic on the Help Chat (I enjoyed TNT's April Fool's prank, by the way). I progressed from the Lost Desert to the Haunted Woods. I'd forgotten how absorbing it is. I just noticed that Kel is precisely 3,000 days old today. Neat. Here comes another ramble about my customisation adventures, so if you're bored of that by now feel free to tune out. (; The following actually all happened before I was incapacitated by my cold. Ddi and Kimey's new looks. I'm not a hundred percent on Ddi's - I feel like it's missing something - but I've spent days staring at it trying to work out what it's missing without success. So it will do, for now. Her customisation probably speaks a lot more to me than it does to anyone else; she probably looks like a mercenary or something, right? She doesn't like to hurt anyone, but she's tough and she badly wants to be self-sufficient. She's only a Grey Zafara underneath the armour. She would gladly be a true Robot; she hates her own emotions and her physical limits, both of which have held her back in the past. Kimey is her foil, being her opposite in many ways. Kimey is a Robot but she knows and understands emotions. She likes to laugh and love and enjoy life. She considers Moltara to be her home - she met Ddi there, when the latter came seeking solutions to her limitations. Ddi left thinking she had found nothing, but she was followed by a friend. ^ That's pretty much the extent of my ideas about those two. It would be good to write a full story about them but I don't know if I ever will. Urk. I've had such a horrible cold these last few days. x.x Am feeling more able to function today, though my nose is still evacuating industriously. I'm afraid I gave up on the item-fetching activity aboard The Coincidence. My first set of items was cheap; my second cost 63,000 NP and the third would cost even more if I were willing to sink that much NP into it - which I'm not. It's evident from TNT's responses in this week's Editorial that they didn't intend for the items to inflate so much so fast, as many of us suspected. If the high prices had been intentional I might have felt more willing; I'd have felt less cheated (not that I was cheated by anyone in particular, just by chance and happenstance) and more confident of there being a worthwhile reward at the end of it. Having seen what the final reward is I'm not especially regretful. It's more the lack of participation that I regret; I don't like that I didn't enjoy this plot/event* to the full. Of course, I know it was my choice not to. I just finished answering TNT's new survey. If you haven't seen it yet, there's a link in the News. I wrote quite a lot in the suggestions section (the 'what would you like to see more of' question). I even spent time reading discussions to see what other people had suggested and including ideas that I agreed with. So I thought I'd share it with you here. Below are my complete suggestions, copy and pasted from the survey. I'd like to see more unique events/plots in place of recurring ones. I think events with mixed activities would go down better than ones that are solely Battledome or solely puzzles. Even if you can't always make them super long like Tale of Woe and Faeries' Ruin, even a small event with a bit of everything would be great. Group activities like the Grave Digging from ToW are usually fun too, can we have more of those in small events? That said, nothing can beat a lovely long comic-driven story plot. :) It's just I know those take a lot of preparation. More surveys! Surveys are good. In place of the Neopies you could do a proper survey like this one and get a more accurate idea of what people actually thought of the year. 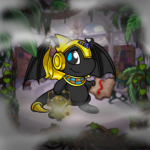 It doesn't have to reward items/neopoints; people who care will take the time to answer it. You could do little surveys after an event to find out which bits of it people liked best, what they would like to see again, etc. You could even have tiny little things like 'Rate this plot step out of 5' or something. More 'Basic' NEOPOINT wearables, like the Mall has been getting. More use of the 'Official Neopets Team Message Board' please. Faster customer service and a functioning ticket system. Revamped Neomail please please please. Conversation threads and a Sent Folder would be neat. Also, it would be really awesome if the revamped Neomail could possibly have some form of CC system. I realise this might be vulnerable to spam BUT I think there are ways of getting around that: For example you could only be able to CC NeoFriends or even better users could have 'CC Approved' lists where User A can add User B to their Approved list so that User B would then be able to include User A in User B's CCs. This would be super helpful for people who maintain petpage sites; pet trading; adopting, guilds, etc. I suppose the Neoboards could be revamped too but I'm not so fussed about that. I would like to see NC Gift Boxes being given out with online NC purchases as well as with NC cards. It simply isn't right that people who can't get the cards where they live are missing out on the Gift Boxes. Or you could do away with Gift Boxes altogether perhaps? Or at least make Gift Box Capsules cheaper and/or more generous. Areas you shouldn't use on sides could be automatically locked off to help prevent cheating and mistakes. It could be easier to move items, neopoints and Neopets between sides and mains. You could have a 'Maximum Neopoints' limit on sides, as neopoints on sides are pretty much only needed for the NeoLodge as far as I'm aware and this would inhibit cheating. You could allow Lutari to be moved between sides and mains. You could allow Paint Brush clothing to be moved between sides and mains (pretty please?). It could be free (free = without the use of Gift Boxes) to move NeoCash items between sides and mains. You might imagine people would buy less copies of NeoCash items if they can do this but for myself personally I believe it would encourage me to buy more NeoCash items because I would be more secure in the knowledge that I can more the items around with ease should I change my mind about which Neopet I want to customise with the items in question; NOT being able to do this has genuinely held me back from buying items I like on several occasions. It could perhaps be made quicker and easier to log in and out between sides and mains. Making it possible to change account names and Neopet names has been discussed in the Editorial I know and I would really love to see this. But they must still be unique, I think. It would undermine a lot of things if it became possible to change them to non-unique names. Besides, the unique names are one of the most appealing things about this site (though there are many appealing things of course ;) ). Please fix the Defenders of Neopia in the Battledome. Higher Max Neopoint limits in user shops, Trading Post and Auctions. That's 20,000+ released for creation and 4,689 created. (I get the numbers from watching the Popularity page.) Last year 20,000 were released and 7,075 were created, while in 2012 26,000 were released and about 12,000 created. The release started relatively promptly at about 01:00 am NST, on the 22nd (Chomby Day). The Chombies continued being released in batches throughout the day and had reached 20,000 by the 23rd. They remained available in Create A Pet through much if not all of the 23rd; they had been removed by 12:51 am on the 24th. I did the untaken names topic on the Help Chat, keeping it bumped up for the first half of the 22nd. AGFL saw 56 names used the first day and 25 the second. Less than previous years, in accordance with the smaller created numbers. I'm just going to give it a day or two so that I can be sure I'm sure about the look before I start buying it. At the end of January I was blogging about how I was redoing a bunch of my Neopets' customisations, which I was enjoying greatly until I stopped. I stopped because I got stuck on Life's. I'm still trying to start with the Decorated Witch Hat and Wig and base the customisation on that, but I'm not coming up with anything I love. Currently saved in my JN Wardrobe are a Camouflage Ogrin and a Stealthy Draik. I like the Ogrin because it's more unusual but I find it harder to work with quadrupedal species, while I like the Draik for it's beautiful Stealthy blue eyes but am finding it harder to make it look unique. I'd like Life to look sort of mysterious and/or magical, maybe Romani-ish, but at the same time I'd like her to have a modern edge, something that would prevent her from looking like an archetype. That's 10,675+ released for creation and 1,316 created. Numbers were acquired from watching the Popularity page. The release was a delayed one, I think. I didn't see the Tonu available at any point during the 21st. The released count (the one in parenthesis) on the Popularity page did jump from 683,589 to 683,735 shortly after noon NST, but none were created. The first time I saw the Tonu available in Create-A-Pet was at 03:00 am NST on the 22nd. The numbers were at 483,125 (out of 684,793). They remained available (and continued to be released) throughout the 22nd. They were still available at 12:30 pm on the 23rd but had gone by 12:10 am on the 24th. I opted not to make my usual untaken names topic on the Help Chat this time, based on Tonu not being very popular. There were 22 names taken from AGFL on the 22nd, a slight jump above the average. Two things happened last week and I'm only now getting around to writing about them. One. I have a new computer. It's better than my old one to enable me to play awesome things like Assassin's Creed, among other reasons. It's also taken a little getting used to (Windows 8 is odd at times). Two. This last week I've also been working on Find A Laugh a bit. I finally got around to removing the defunct Like buttons, which hadn't been working for possibly months, and that led to me being inspired to make a few changes. I've added a weekly Featured screenie page, remade the title image and adjusted various styles around the page. Regarding FAL, I still feel stymied by the lack of new listings but I think I need to accept that the Neopian population simply isn't making as many new screenie pages as it once was. But that doesn't mean people don't still enjoy reading screenies; I know FAL still gets a bunch of visitors. But it's partly knowing I get a lot of visitors that makes me want to provide more frequent updates. Yet I can't provide more updates because there aren't many new pages to list and update about. Silly, isn't it? I mean it's silly that I let myself feel frustrated and wound up by this. I dreamed last night that I was playing the Games Master Challenge or the Daily Dare (not sure which) when I suddenly realised I'd forgotten to blog about it! Hah. Like it would be such a tragedy if I did. I've been working on Life's customisation next but I have yet to hit upon anything I'm satisfied with. My starting point is the Decorated Witch Hat and Wig (because it's awesome) and I might go for a Stealthy paintjob because I want her to look magical/mystical and those Stealthy eyes would do a good job of that. But I'm not sure. I realised today that it has been almost a year since I last played NeoQuest II. @. @ WHAT. Yeah, so I was barrelling through the game when the first rumblings of the Obelisk War started in February 2013. I decided to put NQII aside for the time being and come back to it later. And now suddenly it's been a year. I just checked where I'm up to and I'm at the Palace of Ancient Kings. So it's still there waiting for me, thankfully. I don't know if I'm going to continue it right away (I have other time-wasting hobbies at the moment) but maybe sometime this year, haha...? I definitely want to finish it at some point, I was really enjoying it and I want to know what happens. I feel like I'm 'getting into' customisation. @. @ Which is strange because I had thought I was already into it, but it turns out there are higher skies. This is MoltaraCity's current look, which I like so much that I haven't touched it in weeks. 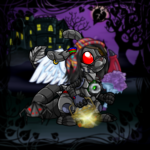 MC being my active Neopet I thought I would want to mess around with his customisation often, like I did when he could wear only backgrounds, but I just... really like it how it is. Which sounds disgustingly self-pleased, I do apologise. 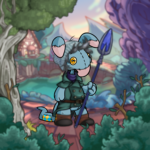 I'm just not accustomed to getting much satisfaction out of my Neopets' customisations (the finished product is usually not quite perfect and I'm a perfectionist). I suspect it helped that MC's customisation wasn't dictated by his characterisation. He doesn't really have much characterisation, so I felt free to mess around and make him look as weird and/or spooky as I wanted. 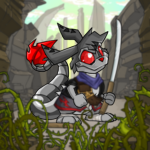 I'm now feeling inspired to improve/reinvent some of my other Neopets. Lostfound, Agiftforlife, Ddianc and Kimeyah especially - I've never been satisfied with any of their looks. Jellyneo's Wardrobe is proving superlatively useful in this. My lurking on the Pound Chat paid off, in a way: I found a Robot Blum up for adoption/trade on the ZYDP adoption agency. I wasn't sure how well my inquiry would go down, seeing as I only wanted the pet for the casings, but the owner was very happy to give him to me to help me out! n.n So a hundred thank-yous to her! Plus we're arranging to Pound-transfer the uncased Blum back to one of her accounts so she can find him a permanent home or keep zapping, which feels good. 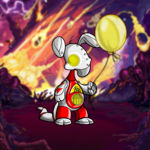 I was lucky enough to get a Desert zap on one of my Blumaroo labrats this morning (6th Blum zap). I then tranferred the pet to my main account and pounded it so I could keep the clothes for customising MoltaraCity. In related news I tried advertising Stylesheet as UFT on the Pound Chat the other day and got zero interest, which was a bit dampening. I did it in the hope of getting an idea of what someone might offer for him, whether he is a suitable offer for an anynamed Robot Blum, but I've come away less than enlightened. It's a Real Word which is good but maybe it's too obscure and/or too long to be very desirable? Who knows. I guess I just need to go for it; jump in there and say 'Seeking Robot Blum' and offer Stylesheet for it. I'm also wondering whether I should offer a custom, too. I think it's going to be difficult because I've been watching the Pound Chat for the last week and I haven't even seen any Robot Blums yet. They're not common. Neither, I imagine, is someone who finds Stylesheet desirable. So I have low odds on both counts. He's smaller than I expected somehow. I'm going to need to expand on my collection of non-Background wearables; currently I don't have many to try out on him. I'm working on acquiring Robot Blum casings. In more ways than one. Zapping Blums in the hope of a Robot zap is a bit of a slim hope, I feel, even with three lab rays working on it. (I once zapped Ddianc for 357 days - nine Morphing Potions - and still no Robot zap. In the end a friend gifted me Kimeyah.) So I've also been scouring the Pound Chat and joining pound surf topics. I've created the name Stylesheet in the hope that I'll be able to use it to trade, and if I manage to find an uncased Robot Blum in the pound then I may be able to re-case it with the help of one of these spare PB clothing sites. I thought I'd cleared out my Safety Deposit Box quite recently, but I noticed today that there was a whole bunch of stuff in there from events like the Daily Dare, Negg Festival and last year's Advent Calendar. I couldn't resist the opportunity to do some sorting. Most of that stuff is now in my shop or being kept in the hope of price inflation (and I've made a list of the latter, complete with dated prices). On another subject, I'm thinking I might morph MoltaraCity into an Invisible Blumaroo. Blumaroo are one of the handful of Invisible pets that can wear clothes and hold holdables. I was always aware that M-City, being a Zafara, can only be customised with wearables that don't come into contact with his body. This wasn't a concern for me because I enjoy backgrounds so much; so many are simply gorgeous to look at on their own, without any adornment. And that's still the case, but I am beginning to fancy a clotheable Invisible pet. There are just so many possibilities, so many neat things you can create by hanging clothes on an invisible prop. I particularly fancy getting my hands on some Robot Blum clothes so I can make a headless surrendering robot (I'm going to start adopting solely Blums from the Pound when I need a pet to zap, in the hope of getting one). So Team Moon (my team) won the GMC. This entry has been a couple of days in coming for that reason; it was easier last year, when the opposing team were the winners and I could go ahead and congratulate them without sounding self-satisfied. Besides, it's pretty much down to luck, isn't it? Team Moon happened to have a larger number of players, presumably. With only two teams (and with Team Moon having been at 51% from the start) it didn't feel, to me, like anyone's efforts were likely to make a difference. So I don't personally feel bothered about which team won or lost. I am bothered, however, by the change in the trophy format. This has been heavily gone over on the Neoboards, but for those who don't know: Every Team Sun trophy is silver, from the simple Level 1 trophy to the complex and beautiful Level 5 one, while every Team Moon trophy is gold. This is a break from previous years, when the trophy colours were based on the levels (the player's individual achievements) rather than which team were the winners and which were the losers. Why? I don't understand why TNT thought this would be a good change to make and I would have preferred they hadn't done it. The GMC has been about individual achievements from the beginning. Originally there weren't even teams - they were only introduced in 2011 - and to me the teams are still only an additional element of the event. I don't feel they are at the heart of the GMC; they are not something which the trophy system should be built around. *I'm immediately suspicious of the Wingoball score because 771 is the game's ID. Seriously, TNT? Same mistake? 771 looks achievable though (my highscore is 991). Had a go at Wingoball with the help of this walkthrough but got stuck on Level 12. Eh. Going to leave it for now. I'm nervous about Bouncy Supreme. My highscore is 580 but I remember having a lot of trouble getting that (I think this was during the DD?). Got it! After a few tries. An eminently useful tip I found is to aim at the highest coin in each arc and to adjust the distance between coin and pointer depending on the height of the next pillar (from Jellyneo's guide). And the play-60-games challenge has registered as complete now that I've sent a score in something today. There are no bonuses for repeating this one, mercifully. Mm, I like the music in Attack of the Gummy Dice. It's nice to feel entirely unrushed in a game. Okay that took some time but I eventually reached 870+ at Level 9. Slow game. Feed Florg just makes feels immoral. Got the score after a couple of almost-got-the-scores. Meepit Juice Break is another lengthy game, though shorter I think than Gummy Dice. 1,100 isn't a particularly challenging score I find. Now, what are the top five strategy games? Being lazy and consulting the Neoboards for a list. Playing Faerie Cloud Racers, Warf Rescue Team, Gadgadsgame, Tyrannian Mini Golf and Petpet Cannonball. Check. It's going to be tedious alternating through that lot for the bonuses, even though it only needs minimal scores. But first. Someone on the Neoboards pointed out that Team Sun have Wingoball today as well and their required score is 790+. So if our 771+ score gets fixed then it will become harder. So there's no point in putting it off, though I'm still befuzzled as to how the ball is supposed to get through Level 12. Yes! Got through Wingoball with the help of The Daily Neopets' guide. I'm erring on the safe side and scoring over 790. Going to get straight onto doing the bonuses, as this is quicker than the other challenges will be. Came back and finished Challenge #2's bonuses first. Now for more Gummy Dice, Florg and Meepits. Wow, that took a while. Too long really (in that I feel guilty about playing games for so much of the day and my mouse hand is a bit sore). But hey. All those shiny tick marks look lovely. Is it just me or is there a subtle theme to today's games? First job: Finish the Petpet Rescue bonuses that I didn't do yesterday evening. And I'll add it to my Favourites before playing so that it counts towards Challenge #2. Got a bit better at Petpet Rescue by the end. Still not a game I'd choose to play, but hey there are few enough of those. Now on to today's games, none of which I'm very familiar with. I feel like any (or all) of them could pose a difficulty. I guess I'll start from the top: Let It Slide and Snow Roller. Mustn't forget to Favourite it before playing. Oookay, the game is lagging. Badly. (Managed to die at 220 points.) I don't remember it doing this before. Will try lowering the quality settings. Nope still lagging. I'm going to try saving and closing this page, as sometimes my computer thinks having a large editbox open is hard work. That didn't help either. And apparently the challenge is glitched and not awarding prizes anyway, according to the Neoboards. I'm going to leave it for now. If the glitch gets sorted later then I might go to the trouble of borrowing my sister's computer, as it's more game-oriented than mine and should be able to cope with LIS. Snowball Fight turns out to be a waiting game, reminiscent of Kass Basher. Wait for the Meepits, wait for the Polarchucks, wait for the wind to change. Could do this all day really. Actually I've stopped waiting for Meepits because I don't think it helps. The speed goes faster based on your total score, therefore waiting for the high-scoring Meepits does not prolong the slow levels. Okay, I hate this game. I'm developing some serious Polarchuck-hitting sk!llz. Also developing some serious tension in my right shoulder and facial muscles. That took a ridiculously long time. Bonuses? Ahahahaha yeah right. Taking a break to relax and have lunch. Some people on the Neoboards believe the required scores for Rink Runner and Snowball Fight are not as intended because the scores are exactly the same as the games' IDs. Rink Runner is located at /games/play.phtml?game_id=220 and its score is 220 (which also happens to be a very difficult score to achieve, even harder than Snowball Fight). I just had a little go at Rink Runner and scored 58. The highest score on the HS Table is 355. So yeah, I'm agreeing with the Wrong Score theory and am going to hope it gets fixed (along with Challenge #1) when TNT get into the office later. Hopefully the Snowball Fight score will be lowered a bit too. In the mean time I'm going to Favourite a bunch of Qualifying Games to work on my Challenge #2 bonuses. I don't know if repeating the same five over and over will count for the bonuses (it might) but I'm going to go ahead and play different ones anyway as it will count toward the play-60-games challenge we're expecting tomorrow. Finished Challenge #2's bonuses. I'm going to keep playing Qualifying Games until I'm closer to 60 (done 48 already) on the basis that I'll be glad of having finished the play-60-games challenge in advance if I don't get the chance to complete all these glitched games before tomorrow. Yes! 09:18 am NST and TNT have fixed the wayward scores and (presumably) Challenge #1. The Rink Runner score is now 44 and Snowball Fight is 350. Time Taken on Rink Runner: 00:03:41. Rink Runner bonuses finished in a matter of minutes. Hmm, not sure whether Challenge #1 is fixed or not - mixed feedback on the Neoboards. Man, 350 is ridiculously more achievable than 650. Okay, most people are saying Challenge #1 works now so I'm going for it. Managed 1,534 on Snow Roller despite the annoying music and my patent inability to jump over the right objects. Made it through a laggy Let It Slide. I took it slow (the timer is only a bonus, not a limit), picking up all the gems and hearts I felt I could reach without risking lives, and had 790 by the end of Level 1. Now working on Challenge #1 bonuses. I'm having trouble replicating my earlier score on Snow Roller. There's a strategy I read on the Neoboards that I quite like; it involves holding the spacebar down and doing nothing else. Doesn't always work though. Took a while and I now feel exhausted but all bonuses finished yes~! Yep, got it. Managed the score on the third try, when I made it through Level 2. I rather enjoy this game, I like the... motion. I'm trying Korbats Lab next. My highscore is 520 but that might be because I've never tried very hard. Died at 670 on my first try, and that only because I was trying to eat breakfast at the same time. The game is a bit slow though - I might leave the bonuses until later. Okay apparently I have never played Petpet Rescue. Wish me luck? Whaaaat is this? This is insane! Right, so I scored 110 after a few tries but it hasn't registered that challenge as complete. A glance at the Neoboards tells me this is the case for everyone. Is this the first glitch of GMC '13?! Moving on to Kass Basher and Super Hasee Bounce. Both scores look very achievable, even though I dislike bouncing Hasees. Done! Now for the Korbats Lab bonuses. I used to play a version of Breakout all the time when I was younger (prior to my discovery of Neopia, I think). I liked the versions with lots of powerups (and powerdowns). Plus there was a feature where you could build your own levels. I think I'm out practice. Okay I was growing tired of Korbats Lab by the fifth play. Someone on the Neoboards has pointed out that Petpet Rescue isn't even on the Qualifying Games List. Hmm... Hopefully TNT will fix the issue before the end of the day. I'm going to go send minimal scores in Cloud Raiders and Cooty Wars (Team Sun's alternate games for today) and then check back later to see if anything's happened about Petpet Rescue. Checking back in my evening and it looks like TNT have fixed the Petpet Rescue glitch. Hurrah! Okay, I just scored 115 and it still didn't register the challenge as complete...? Tried for a higher score; 125 worked. Challenge complete! I'm going to leave the bonuses until tomorrow, I'm a bit too tired for the anxiety of rescuing petpets. I consulted the Neoboards to identify the mystery game again, as I felt the clue ('Don't Get Docked...') could apply to several games. I'm not confident about this game, I've played it in the past and had trouble with it and my highscore is only 310. My highscore on Berry Bash is 136. xD I'm hoping that's because I've never really played it, not because I'm terrible at it. At least I'm not worried about MCII and TR, they shouldn't be a problem. Decided to try Berry Bash first after reading some tips on the Neoboards. I'm actually not finding it difficult at all. It doesn't begin feeling rushed until way past 1,000. Completed the bonuses for Berry Bash. Moving on to [Stowaway Sting]! Scored 444 in [Stowaway Sting], haha. At least it's an improvement on 310. Okay, managed to get 445+ after looking up a video guide. Now for the bonuses. Phew, glad to have got that done. Now I feel like the worst is out the way. Then again, maybe not. Took me several tries before I managed 400+ in Turmac Roll. I keep landing on the points of those large ramps. 250+ in Meerca Chase is no trouble, mercifully. I'm getting better at jumping over the large ramps. Whenever there might be one I hold the jump key down so that Turmac does the biggest jump he can. Sometimes it works. Frustratingly keep missing the high-scoring berries. There's this red spicy-looking one that I have yet to catch ever. I think I mind Meerca Chase less than I mind Turmac Roll because when I crash into something in MC it usually feels like my fault; in TR it usually doesn't. Still playing TR about ten times for every successful 400+ score though. I'm playing on Hard, by the way, based on advice from the Neoboards. I recommend not watching your score, however mesmeric its gentle rise might be. Heh I like the Conkerberry Negg. I saw the Conkerberry in-game a minute ago and wondered whether it was meant to look like a conker (a horse chestnut). Evidently it is. Also, I just looked up what games Team Sun has been playing the last few days and I am delighted to see they've had Ultimate Bullseye II, because that means Team Moon won't be playing it. UBII was my bane in last year's GMC. Later, I decided to send minimal scores in the six games Team Sun has played that Team Moon hasn't. This will count in advance towards the send-60-scores challenge which the GMC usually gives us on the last day. I'm pretty sure I know what the mystery game is, since the clue is 'Celestial Spheres'. The thing about [Spinacles] is that it takes so long. Fortunately it is not demanding, so I can eat breakfast while I play it. Yeah so that took a while. I won't start on the bonuses for that game until last, I think. The timer on Nova Defender gives you twelve hours, so it's not exactly a rush. I'm going to do my Nova Defender bonuses while I'm here since it doesn't take long. I keep forgetting I don't have to avoid the bits of rock floating about. When I'm careful about picking up all the gems then I can get the required score by the end of Level 1 on Hard Mode. Okay done. Moving on to Challenge #1. I positively enjoy Bruno's Backwoods Breakaway (ever since being forced to play it in last year's GMC) so that one won't be a problem. Less sanguine about Edna's Shadow but at least it doesn't look like a challenging score. I've really bad at watching two things at once but I managed to get the Edna's Shadow score after a couple of tries. It helped when I noticed I could shoot a spell at the enemies, haha. I guess I'll do the Challenge #1 bonuses before returning to Challenge #3. Edna's Shadow is easier now that I've got the hang of the few levels I need to complete to score 310+. There, done, now I just need to do those [Spinacles] bonuses. I had to leave then, but I finished those bonuses when I returned. I've noticed some people on the Neoboards have started working on sending scores in 60 different qualifying games, in preparation for the challenge we usually get on the last day which asks this of us. I'm not sure whether it's worth starting it now though; last year I only needed to score in 19 more games after playing everything else required in the event. Doing 60 early on seems like more effort, unless you fear having time for it on the last day. Anyway, to today's challenges... I don't much like Top Chop but my highscore is 1,378 so hopefully I won't struggle with it. Couldn't figure out what the mystery game was, so I looked on the Neoboards for the answer. Hah, now I get the clue! And my highscore is 3,882, reassuringly. Yep, not finding this one particularly difficult. Scored over 2,200 by Level 14, on Normal Mode. I'll do the bonuses while I'm here and then move on to Top Chop. I just keep failing on the third level. Still no Top Chop bonuses complete but I'm taking a break to calm down. Try again later. It begins! I'm going to be sharing my trials here like I did last year. I've joined Team Moon, not because I can call myself a nocturnal creature but because I like Princess Lunara. Tediously adding 25 games to my Favourites for the first challenge and its bonuses. Bumble Beams shouldn't be a problem, I've always quite liked it and my high score is 1,901. It's nice not to have to worry about dropping the petpets into their buckets with perfect accuracy; even with mostly imprecise drops I had 231 by the end of Level 2. Now to rinse and repeat for the bonuses. The game keeps showing my score as 00 on the page where it asks if I want to send it, but my actual score does go through correctly when I do send. I just noticed my left hand has been hovering over the spacebar the whole time, as if that key controlled something in the game. Day One complete. [C=] Got a book for one of my bonus prizes, Rebme will be pleased. Having The Expanded Calendar on my main account gave me the kick to revamp it a bit to fix some of my dissatisfactions. It's here. [C=] What do you think of the semi-new layout? My original intention in redesigning it was merely to create a bit of space for small features like the 'Coming Up' and 'Latest News', so I had to move the navigation links for that - which I'm happy I did because I think it's an improvement to have them laid out in a vertical list rather than squashed in a rectangle. And I moved (and redesigned) the title image. I wanted January to be right there when you arrive, rather than it being pushed down (marginalised) by the title and large block of intro text. As you'll have noticed, this means the title now disappears when you select an event (or News or Sitely) but you can return to it at any time by clicking the little X in the top-right hand corner of an entry. I've also edited all the entries with the goal of cutting out the history and trivia and focusing more on what you can expect from an event today. Plus I've added subheadings (such as 'Summary', 'Avatar' and 'Past Dates' - see GMC for an example) to long entries, to make it easier to skim for the information you're looking for. Sooo happy right now because my internet seems to be back up to speed, after ten days working at snail's pace (download speed of about 4 Mbps, while I should usually get 18-20 Mbps). I *think* we fixed it by turning the router off and on. I'm not certain though because I didn't actually notice an immediate difference. It was an hour or so later that I found it had sped up again. Hopefully it stays this way. I've decided to move The Expanded Calendar from /~Mawf to /~Rebme. (Please update any links or bookmarks, thanks!) This move is so that TEC now lives on my main account rather than a side, making it quicker and easier to update when something comes up. It's not that I'm somehow incapable of updating sites that are on my side accounts. AGFL is on a side account, but updating AGFL is not a problem because I do it once a day, at the same time every day. TEC needs updating on a more 'when the information comes in' basis. So to be able to do that any time of the day, without having to go and log on to one of my sides... That will be a good thing. Have you caught a glimpse of the monster while searching The Perilous Catacombs? Surely it must mean we are getting close! Very close. Like, perhaps you want to get as many floors in as you can before tomorrow ends. We're not psychic or anything. Just sayin'. So I genuinely thought the Perilous Catacombs would end at Floor 100. But they didn't. It's been a week now, right? This step began on the 22nd. I was enjoying it but now we're past Floor 100 I feel like the end is no longer in sight and I'm low on motivation. I don't want to stop before it's finished but when is it going to finish? Plus my internet is being slow and I have no idea why. Pages taking about three times longer to load than usual. Takes forever to check the names on AGFL in the morning. It's been this way since the 24th. I've tried things like doing a virus scan and a system restore, to try to fix whatever the problem is, but without success. A Gift For Life is five years old today. Which is, you know, kind of awesome. I marked the day by adding 300 new names that I've been collating this past week. It's odd. Five years feels like such a hugely long time that it doesn't quite mesh, in my head, with how long I feel AGFL has been open for. Funny how time feels different depending on the context. That's 15,000+ released for creation and 3,137 created. Numbers acquired from watching the Popularity page. The release started just a couple of minutes after midnight. Continued throughout the 16th and remained available throughout the 17th. A regular perfect release. I made the untaken names topic as usual but was less regular about keeping it bumped up as I had things going on that day. As to names taken from AGFL, 20 were used on the first day and 16 on the second. This is pretty much in line with the inconsequential numbers of last year. Can you believe A Gift For Life is going to be five years old come the 24th?! I forgot to mention, I made a Poogle on Thursday. [C=] Not just made one to zap - made one to keep. He's called Lostfound. I found the name was available a few days before Poogle Day and thought it would make an apt Plushie pet. I've always kinda liked the Plushie Poogle; it looks very huggable (unlike the Malevolent Sentient version). That's 15,000+ released for creation and 4,824 created. Continuing the dive that is probably brought on by the Red Poogle Morphing Potion being so affordable these days. I mused about this last year, when a little over 11,000 Poogles were created, comparing it to the 31,000 created back in 2011. The difference is that last year the Poogles still took a huge bite out of A Gift For Life, taking 357 names (actually a rise on both 2011 and 2010), whereas this year they have only taken 105 names. I'm surprised and obscurely disappointed by that. It was a good, regular release anyway. Started at 12:10 am NST on the 19th, continued in batches throughout the day, and they remained available throughout the 20th as well. Perfect, really. Haven't had much to blog about lately, unfortunately. It occurred to me halfway through the Daily Dare that I could have been rambling about how I got on with each day's game, like I did with the last Games Master Challenge, but by then I didn't feel I could recall what I thought about each game with adequate accuracy. Maybe next year? Though hopefully we'll be having another GMC before then (in November). Anyway I enjoyed the DD, as per usual. They didn't do a lot with the whole Chadley thing. I don't think it really made any impact on the format so it was just another Daily Dare but hey, I like the DD. In other news I've made a few minor changes to A Gift For Life, today and yesterday. General improvements really. I started out just revising some of the text (like rewriting the intro) and then I decided to do something about the colour scheme being broken since I removed the Username section two months ago. It used to be that the Home area was multicoloured while the Petnames, Usernames, Extras and Sitely were blue, red, green and yellow respectively. But then, as I say, I removed the Usernames so then there was a lack of a red area. So now I've fixed it by making the Home area blue and the Names (née Petnames) red. Aaand then I renamed a bunch of stuff in my CSS because it was embarrassing how I had no idea which bits were doing what. And then I expanded the navigational menu in the Home area. It's now a full 'site map', linking to every section of the site instead of just the three areas. I'm pleased with that bit, I'm glad it occurred to me to do it. Why is it when I sit down to make one small adjustment to one of my sites I always end up going on these long and involved Site Improvement kicks? I guess the answer to that is reasonably obvious actually. I just don't think about what I could improve when all I'm doing is daily maintenance. I need to actually sit down and improve something in order to get into the 'improving shtuff' frame of mind. Yay for answering my own question. A very delayed Daily Dare arrives! But minus AAA, because apparently he's at Game Design Camp. Instead we have a young Zafara named Chadley, who is suspiciously charming. We also have a toony map of Neopia, which I like though I'm not yet sure what its purpose is. And we begin off with Jolly Jugglers, requiring a score of 697 to beat Chadley or 200 to beat Abigail. I've never liked that game and I failed to come up with the motivation to try to beat Chadley, as 700 is so far beyond my highscore. Not a propitious start but hey. That's 5,000+ released for creation and 3,273 created. The release started promptly at about 12:15 am NST on the 17th. They were released in batches throughout the day and then also remained available for creation during the 18th, cutting off at about 11:50 pm. I maintained the untaken names topic on the 17th, though I wasn't very attentive about keeping it bumped up because Kikos just don't get as much interest as some of the other Limited Edition species. AGFL saw 29 names used on the 17th and 14 on the 18th. 43 total, though I can tell you only half of those were actually Kikos. when the computer is running it heats my room up terribly and then I melt into a puddle that seeps through the floorboards and into the room below, creating a large water mark on the ceiling. So this is late but my spreadsheet of species is finished. I put it up in the Extras area on AGFL, back on the 3rd I think. I forgot I meant to blog about it as well. This page is very interesting, but it has been tracking species popularity for years so the numbers are massively ackumulative; older species have a huge headstart on newer species. Plus it only counts Neopets created through the Create-a-Pet page, discluding alternate methods such as Morphing Potions, Draik Eggs and Krawk petpets. So I wondered: How accurate is it really? In June, 2013, a total of 405 petnames were used from A Gift For Life and I recorded the species of each. I delayed my recording by 24-48 hours from the name's creation, to allow for those alternate methods. Below are the results, ordered first alphabetically and then by popularity descending. There's no particular reason the alphabetical list has numbers on the left of it, I don't know why I included them. So Draiks are leading in popularity at the moment. They were made nearly every day of June, there were only three days when they weren't. Krawks are way below with only nine made. That answers my original query about how much they are being made these days and which is more popular. Interestingly, the Brutes won the latest Battleground skirmish, despite the bandwagon having chosen Thieves. The month is nearly finished, and so is my spreadsheet of species created with names from AGFL. [=D] Just a few more days. I'll be done on the 2nd July. I'm thinking I'll probably put the results on AGFL, in the Extras, in case they interest anyone. Yesterday I made the decision to remove the untaken usernames from A Gift For Life. It now only provides petnames. I'd been thinking about this for a little while. I've never been as enthused about finding untaken usernames as I have petnames - I've never found it as easy or enjoyable - and I tend to not 'get around to it', particularly as there are there are more important things to do (outside Neopets). And then this glitch/problem came along where we can't tell whether a username is really untaken because even when it appears available here it may be in use on one of Neo's sister sites and therefore be uncreatable. So it's become impossible to maintain an accurate list. So I considered all this and decided that I would feel mostly happy about removing the usernames, although I am sorry to anyone who visits AGFL for usernames rather than petnames. And since then I've been thinking I might be able to improve AGFL with a slight layout revamp. If I separated the different name categories out a bit more I could then create navigation for within each category, such as alphabet navigation. And it has in the past been suggested to me that it might be better to order the Multilingual section (real words in languages other than English) by language, which would also be made possible. But I'd need to look into whether the majority of people would want that. Also they might want the Places of Earth to be ordered by country? Also a possibility. I do not see the point in the Battleground. A lot of people (if not most) are simply jumping on the biggest bandwagon for each skirmish. The winner is predictable and for me that takes nearly all the motivation out of the thing. I stuck with Seekers at first, out of loyalty, up until the time that they were not one of the options and then I choose to go with the predicted and actual winner (Brutes). The Seekers are available again for this skirmish (signups started today) but polls on the Neoboards indicate that about 99% of players are joining Awakened, soo... yeah, me too please. The only motivation I have for joining a faction and playing a few battles is the boons and maybe the avatar and site theme, although I haven't liked the look of the av and theme so probably won't use them (but completionism!). It seems likely to me that the Battleground is intended to continue indefinitely, but I doubt whether people will be bothered to participate indefinitely. I won't be. If/when I've earned all the avatars and themes I shall probably stop because I'll be bored of it by then and will have lost interest in the boons. Speaking of being bored of things... Altador Cup? Yeah. Played three games in case I found it more entertaining than last year but no. It frustrates me before it bores me, to be truthful, but I'm not one for playing the same flash game a million times anyway. Not my thing, not what I call fun. My species recording is trundling along. I found a difference between the immediate and delayed records on the third day so I've dropped the immediate and am now only doing delayed recording (meaning I'm recording the species 24 hours after I found the names were taken). So I currently have five days (1st-5th) with a total of 80 names taken. Top contenders are Draik (10), Kacheek (7) and Xweetok (5). The rest are all 0-4. There are quite a few zeros yet. I used Microsoft Excel for the first time today. Decided it would be useful for this species recording I'm doing (see previous entry). And it is. I had to look up a video tutorial to learn how to do things, but it was very clear and easy to get to grips with. The other day I talked about possibly delaying my recording by 24 hours to ensure that the pet has been morphed into the desired species by the time I record it. I've decided to start off doing both immediate and delayed recording in two spreadsheets. If after a few days I find there are never any differences between them then I can drop the delayed one. Someone asked on the Help Chat yesterday whether people still liked Draiks and Krawks as much now that they are significantly easier (less expensive) to obtain. I didn't stick around for the results, but it reminded me of something else. When checking the names on A Gift For Life, I definitely see names being used for Draiks and Krawks more than I used to. Draiks a bit more than Krawks, I think. Oh but this is far too vague! 'A bit more'?! No no no. I must acquire surer facts than this! To that end I've decided I'm going to be recording the species of all the names taken during June. That should be about 400 names total, according to my averages. And there are no Limited Edition pet days in June, so nothing to throw the results out of whack. The only thing I might stumble over is what if the species has already been changed before I check the names? Say someone wanted a Poogle, they might create a JubJub and then immediately use a Poogle Morphing Potion on it. What does that mean for my results? ...Actually, I don't think that'll matter. The person didn't want a JubJub, right? They wanted a Poogle. And that's what I'm trying to produce statistics on: the species that people want. The choice of JubJub was arbitrary and therefore irrelevant. In fact I might even delay recording the species for say 24 hours, to give people time to transform the pet to the species they intend it to be. I check the names every day and inevitably there are occasions when a name has only been taken for one or two hours (or less) before I see it, in which case the pet might not have been morphed yet. That's 5,000+ released for creation and 5,021 created. The first release was at 01:21 am NST on the 25th. They also remained available throughout the 26th, cutting off at 11:54 pm. AGFL saw 30 petnames taken the first day and 13 the second. Previous years have been equally low-impact. I added ten new questions to the Quiz today, as per my new monthly schedule. Koi Day tomorrow. Although it is a Limited Edition pet it doesn't typically take huge numbers. Not marking the occasion with anything special, didn't have any plans to. I felt compelled to write a little something for Always Connected today. It's titled 'The Fearful Shadow of Copying' and you can find it under Text-Based Articles, or below. I have the greatest respect for copyright. I always try to be original and avoid copying others' ideas, as I'm sure we all do. But I think it's possible to worry about copying a little too much. Too much' might be when we're afraid of even looking at someone else's work for fear of unconsciously imitating it in our own. If we don't look at others' work then how are we going to learn and improve? We read and scrutinise novels to improve at writing - in fact, read a lot and widely is a piece of advice that authors often give to the aspiring. Not so that new writers can copy what they read, but so that they can decide what they feel works and doesn't work, what they like and don't like, and then reapply that within their own unique books. This form of learning works for many things, especially creative things and definitely site-making. I firmly believe it's possible for us to study another site's layout, coding, content and style of writing without suddenly finding ourselves imitating everything in a shocking breach of copyright and courtesy. We only have to bear it in mind and remember to respect others' unique ideas. If we do this then I think we are unlikely to fall foul of either conscious or unconscious copying. As you can see, I managed to come up with a new layout. [=D] It's anchored with the navigation in a fixed title area, but the overflow is not hidden so you're free to scroll about as you like. So, to clarify, this page now contains my 'about me' and my ramblings about my sites, etc. The Writing section is still under construction. The Favourites section is new, being the expansion of the 'Interesting Reading' I used to have in the blog's sidebar. I shall add more favourites over time. The Quest (actually titled 'Question') went live a couple of days ago~! I forgot to mention it here because I was too busy remembering to mention it on FAL and on Always Connected and such. I might try advertising it on the Help Chat at some point this weekend, but... I'm actually hesitating because it's not very 'Help' related. I suppose it would be all right if I included FAL in the topic (asking for new pages to list). you choose fear, I say why so serious? The Expanded Calendar is two years old today! Golly, where does the time go? And over on Find A Laugh I'm attempting to encourage people into starting their own screenie pages, all this month. Maybe I should just leave things as they are? will we leave behind a mark? will we leave behind a scar? That's 10k released for creation and 10.8k created. And there I was thinking the numbers had stopped being confusing. The last time this discrepancy happened, as far as I could tell, was Poogle Day '12. I believe (but don't know) that the discrepancy is down to the pre-existing difference between the created and released counts; there was over 5,000 difference on the Before numbers, which has ackumulated from a previous Hissi Day when the created count was lower than the released count and the Hissi's availability cut off before they were all used up. I've supposed that this leaves 5,000 sitting 'hidden' in Create A Pet, so, when the next Hissi Day comes along, they become available again along with the 10,000 change that we can actually see. So this would mean that a total of 15,000 were available. Anyway. It was a reasonably prompt release: Started at :21 on the 4th. The Hissi also remained available throughout the 5th as well, as per normal, eventually disappearing from Create A Pet between 11:20 and 11:45 pm NST (I was watching). Hissi Day report is coming tomorrow, not today, as they are currently still available for creation. I'm thinking I'd like to merge this blog and my About Me onto the one page. The result will probably be here on MoltaraCity's petpage rather than on Weaponstar's petpage, as M-City is on my main account and therefore easier to access for doing new blog posts. It will require a new layout. Which is fine, I'm just sort of waiting on inspiration for that at the moment. I plan on making it clear that this isn't a very interesting blog, something I would have it be known that I recognise. [C;] I mean this blog is basically just me talking about my stuff. If you find that of interest then that's cool, but I'd wager that you're in the minority. Also. I'm thinking I'd like to expand on that little 'Interesting Reading' section I've got on the right. Might post little notes about other pages I like. The notes would probably be dated like blog posts but would definitely be separate to this blog. I'd just like to spread some appreciation, you know? Because appreciation is good stuff. That's 25k released for creation and 13k actually created. Familiar format: The release started promptly on the 27th, a few minutes past midnight. The Cybunnies continued to be released in batches throughout the day, and then remained available in Create A Pet throughout the 28th. They became unavailable a few minutes before the 29th. AGFL saw 146 petnames taken the first day (hitting 20k total, as mentioned in my last post) and 26 the second day. This is an unusually small number; previous years have taken 293, 216 and 299. My untaken names site, A Gift For Life, opened in October 2008. I don't have many records or archived news from its first year, but I do know that it reached its 5,000th used petname after nineteen months, on 4th May (Hissi Day) 2010. The coincidence, as I see it, doesn't lie in the milestone hitting the exact same day every year, but in the milestone hitting the end of April every year. The LE pet days use 150+ names over 24 hours; therefore the milestone is more likely to land on that particular day than on one of the normal days (which use 10-20 names) around it. I'm surprised the yearly usage is so regular, that there are no fluctuations, increases or declines large enough to prevent the 5,000th from falling at the end of April again and again. I think I have to draw the conclusion that AGFL is not getting any more popular? That it has long since hit its peak and the line on the graph is now travelling horizontally? I don't mind. I mean, gosh, it certainly isn't unpopular. (20,000 used names! Insane. Awesome.) Rather, the fact that I've always felt that it is quite popular (from the usage of the names, from lovely feedback and from seeing people post the link when anyone requests name sites on the boards) has lead me to assume that its traffic would continue to grow, slowly, steadily, over time. But evidently it hasn't. I don't know why. That's 20k released for creation and 16.5k actually created. The Lutari began releasing mere minutes into the 19th. (I'm glad to see this new trend taking over from the one where LE pets wouldn't start releasing until hours in.) At first the number of available Lutari would run out between batches, but supply got ahead of demand in a little while. I made a record of the numbers at 04:00 am NST: The released count was one thousand higher than the created count, so there were plenty available then. The Lutari remained available for creation right through the 19th and the 20th. They cut off very promptly at midnight on the 20th. Usually I'm not around to take note of this and therefore can't be sure whether they became unavailable at midnight or earlier on, but I was able to take note on this occasion. I maintained the untaken names topic on the Help Chat on the 19th, during the time that I was not sleeping. A couple of people gave the topic a bump after I'd retired to bed, which was nice. AGFL had precisely 250 petnames taken on the 19th and then 44 on the 20th. Last year had 149 first day and 127 the second, though it was a little different that year because the release didn't start until seven hours into the 19th. The year before that had 140 total. I've made a new Neopet: Pilbeam. Pilbeam is the name of a character from a lovely book series called 'The Mennyms' by Sylvia Waugh. It's about a family of lifesize ragdolls who are alive and must try to lead a quiet life unnoticed by normal people. The books are aimed at children but they are perfectly intelligent with great characters, so I don't think that their being 'for children' means an adult wouldn't enjoy them. I first read them when I was ten (actually my mum read them to me and she loved them too) and I'm twenty now and they remain one of my favourite reads. Pilbeam-The-Peophin is going to be painted Plushie, but it might take a while. I'm not Key Questing at the moment (I stopped during the Obelisk War and haven't been in the mood to get back into it) so the only neopoints coming in are from daily Battledoming and the Stockmarket. Also not been NeoQuesting. That stopped with the onset of the War also. I fully intend to finish it, just not at this time. I seem to have acquired a new project! [=O] While improving Find A Laugh I decided to remove some of the old games from FAL's Games section (all except the Quiz) and come up with new ones. But the idea that I've come up with is... quite a big one. If you've seen the latest update on FAL then you'll know I've given the project the working title of 'Quest'. That's about all I want to reveal at this point, so early on. I don't want to be excitedly telling people all about this game and then perhaps come up against a major roadblock that prevents me from doing what I said I was going to do. Fortunately some of the coding involved in this project is perfectly tedious. This is good because it means it will be easier for me to resist working on it 24/7 and neglecting more important duties such as my real-life writing. On the 22nd the Chombies started releasing very promptly, at least as soon as 12:15 am if not on the hour itself. I kept an unusually frequent record of the numbers shown on the Popularity page for the first 12 hours so I'm pasting it in here in case of interest. For newcomers to the ways of the Popularity page I should mention: The first number is how many Chombies have been created, while the second (the one in brackets) is how many have been released for creation. The released count did not rise any more, but the created count did rise, slowly, since a large number of Chombies still remained available in Create-A-Pet. I checked on the availability periodically. They were still available at 02:55 pm, but had gone when I looked at on the 24th at 12:23 am. I don't know if they cut off at midnight or some time before that. A Gift For Life saw 81 petnames used on the 22nd and 22 petnames used on the 23rd. Liked the Obelisk War, by the way. Not that it's quite over yet; we're waiting on the results of our battling. I feel like I could have been blogging about the war as it went along, but it didn't occur to me at the time. We were a few hours into the 21st (Tonu Day) before the release started. It was about 08:30 am NST. They continued being released into the 22nd, reaching the total of 20,000ish at some point between midnight of the 21st and 07:50 am of the 22nd. They remained available in Create-A-Pet into the 23rd, cutting off at some point before 08:30 am. I maintained the untaken names topic on the Help Chat for some hours on the 21st. AGFL saw 20 taken petnames on the 21st, barely higher than an ordinary day. I've reached the third chapter of NQII already. [o.o] The Terror Mountain chapter felt about half the length of the Meridell one. A lot of people think we're going to be able to choose a faction to support and I'd agree it seems very likely (we'll all be disappointed it if we can't). Who might you support? Thieves Guild, The Sway, The Order of the Red Erisim, Brute Squad, or the Seekers? You know, much as I'm delighting in all these new folk we're being introduced to I've remained inclined to choose the Thieves Guild up until today. And then they gave us the Seekers. Scholars. Seeking knowledge. They want to save the Obelisk from the potential damage it might suffer being fought over by the other four. They want to study it, to learn from it. To my thinking that's the most altruistic reason we've had. Scholars FTW! In other news, I've finished my New Year's resolution! [=D] If you recall I resolved to improve A Gift For Life a bit by upping the Combinations and the Incorrections sections up to 500 names each, as that is the number I try to keep the other main sections at. The last batch of Incorrections was added this morning, taking it up to 505. My mouse-arm is feeling suspiciously hot and irritated this evening. [e___e] I suspect it has something to do with an over-indulgence in NeoQuest II these last couple of days. And I'm totally blaming Jellyneo for this, because it was their neat new guide that inspired me to have another go at NQII. I've tried playing it in the past but never got further than, say, a couple of levels. I'm not sure why; it's not like there's a dearth of NQII guides here on Neopian petpages. I just hadn't gotten into it like I have this time. I mean, I find it kinda dead boring, to be honest. The constant level-grinding. Urh. But there's a sense of achievement there, too, and I've always fancied having the trophy, being able to say 'I finished that'. And then I got ill. [n______n;] Caught a virus after my website (now fixed) caught its own, hah. I spent all of yesterday curled up rereading Deathly Hallows. Anyway. Something I was going to mention before all that was my Neopets Closet. I've had problems accessing my Customisation page for a while now (Shockwave kept crashing) but I was under the impression that this was a browser issue rather than anything to do with my Closet having too many items in it (which I didn't think it did anyway). I use Chrome for most things and that was where the Customisation page couldn't load, but I found that if I logged on with Firefox I could access it. But then the other day I went to do this very thing and it wouldn't load. So that was puzzling. I figured the only other possibility was that I did have an overloaded Closet, so I set to clearing it out. It's been my habit for years to throw every free wearable I come by straight in there, whether or not any of my Neopets would ever deign to wear it. After multiple Advent Calendars, Daily Dares, Games Master Challenges and whatever else, that does add up. So that's awesome. I don't change around most of my Neopets' customisation much, but I do like to change MoltaraCity's (Invisible Zaf who allows me to enjoy Backgrounds) and Yellowace778899's (whose clothes tend to need putting back on every time the Lab Ray zaps her into a different species). Visitors to my sites may have noticed I've been having some image-hosting troubles the last couple of days. Well, in a way. Without going into disallowed details: I actually 'host' my images on my own personal website, rather than on an image-hosting site, but my website has had a malware attack. As it's been a couple of days now and I haven't managed to fix it, this morning I reuploaded all my layout graphics, buttons and other Neo-relevant images to one of these image-hosting sites so I could get my Neopets pages back up and running. That's all done now and they'll all fine and up-to-date once more. As I understand it, the malware that was put on my website would not have been able to affect anything or anybody merely from someone accessing the images that were stored there. It's not the same thing as visiting the website itself. But it was necessary to reupload the images elsewhere anyway because my website had been marked as unsafe by at least one popular search engine and this was also flagging the occurrences of my website's address within the coding that fetched my images here on my pages. So if anyone was getting stopped by a malware warning when trying to access one of my pages the other day then that was why. And I'd like to assure you that my pages are absolutely 100% safe now. AGFL's expansion continues~! The Combinations section reached the target of 500 a few days ago. The Incorrections still have a way to go however, especially since I looked through it yesterday and removed 89 old names that I felt weren't up to the new standard. All those numbers I posted at the start of this are now redundant, mostly. Since I'm progressing faster than expected, the whole factor of including how many names might get taken in x months is irrelevant. The Incorrections were 158 short of 500 and the Combinations were lacking 58. All that's happening is I'm filling up those gaps. So you know how I resolved to expand the Incorrections and Combinations sections of AGFL to 500 names each? And that this was going to happen over twelve-maybe-six months? Yeah, no. At this point it's looking like I'll be done by the end of January, easy. I somehow seriously underestimated my ability to create names for those categories. I guess it's because I didn't create names for those categories very often - because of the low demand - so I never had to test my limits. I thought the Incorrections in particular would be a challenge because I've never much enjoyed that category. But with 191 names to make I was forced to get creative and turn it into something I really like. I've added 'Nonce words' (made-up words with made-up meanings, something AGFL did once have a long time ago) and have allowed myself to use numbers in misspellings. I'm aware, by the fact that the Incorrections is the least popular category on AGFL, that such things aren't everyone's cup of tea. They're not really my cup of tea either but I'm finding it is possible to find nicely done and often very short misspellings. I'm feeling very enthusiastic about what I'm producing right now. On the 3rd of August I shared some numbers from AGFL - specifically, the monthly totals for names added and names taken. That's all I can do because I only started saving AGFL's old news in late 2009. I'm missing the numbers from then back to October '08. It is a little interesting, for me at least. I don't claim the same for you. [C;] Unfortunately any questions this inspires have no answer, because I have no idea why, for example, 2011 saw a thousand less taken petnames than 2010 or 2012. No idea. Chance, I suppose. The same chance that made the 2010 and 2013 takens, 5048 and 5191, turn out so close. I mean, I don't think I actually have a large enough sample here to draw any real conclusions from it, sadly. I don't usually make new year's resolutions (especially not self-improvement ones) but there's an AGFL-related goal I have in mind so, hey, why not, let's call it a resolution. The Incorrections are currently 158 short of 500. I'm estimating that about 66 names will be used during the year, based on last year, so together that's 224. Divide by 12 for a monthly target: 18.6 rounded to 19. The Combinations need 58, plus 124 used. That's 182, divided by 12 = 15.1 rounded to 16. Those numbers look excessively achievable for a monthly target, considering I usually churn out new names about a bajillion times in a month. So... maybe I could do this in six months? That would give me targets of 38 and 31. Hmm. That might pose a challenge if I run out of inspiration, but... sure. I'll start off with that, at least. See how it goes. Edit: So yeah, I sort of forgot to half the 'estimated names used' when doubling up for six months instead of twelve. For six months the monthly targets would actually be 32 (Incorrections) and 22 (Combinations). This is a Neopets-centric blog, where I ramble about what I'm working on regarding my sites or other Neopian activities. NEOPETS, characters, logos, names and all related indicia are trademarks of Neopets, Inc., © 1999-2014. Used with permission. All rights reserved.